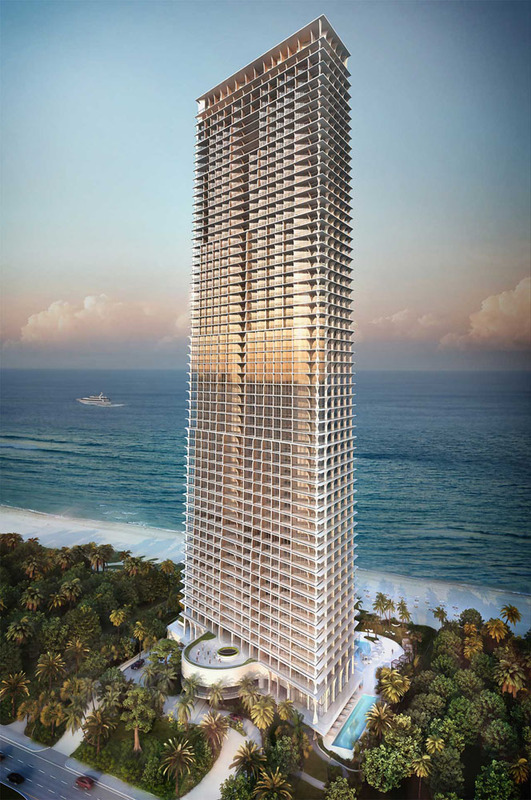 Jade signature is an extraordinary oceanfront building tailored to its surrounding environment, yet based on simplicity. it is rooted in history, but is the new miami. Much like the great hotels that miami is famous for, the tower is embedded in the landscape and its surroundings. 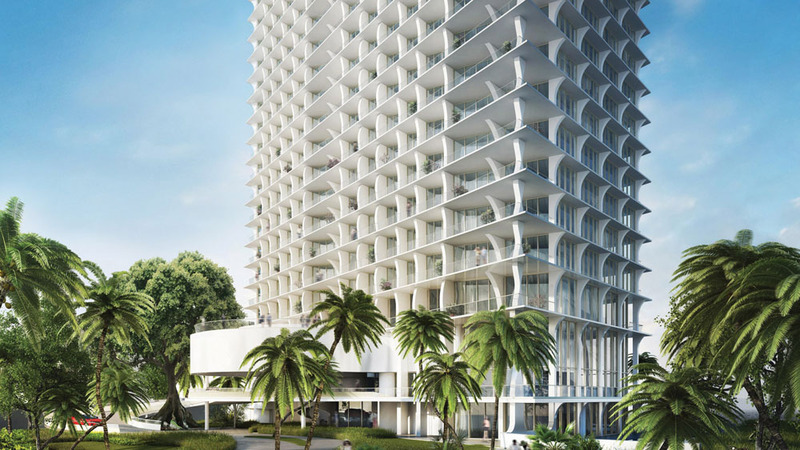 there is a seamless connection between the street and arrival, the lobby, amenities, and the resort deck and beach. 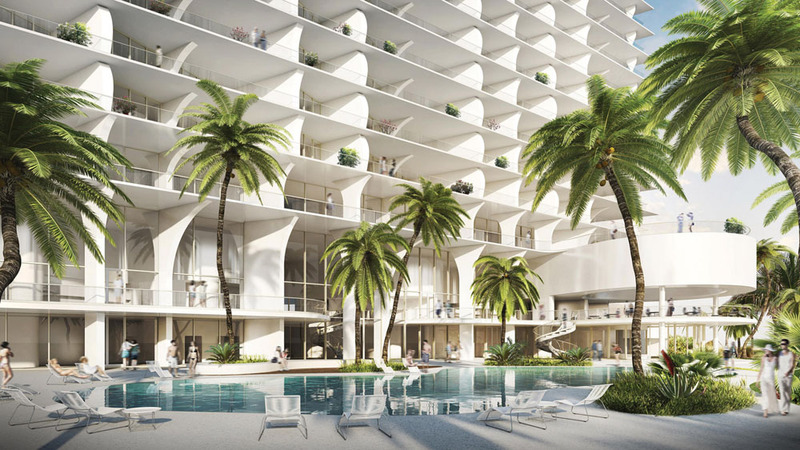 this is a departure from most residential towers, and will allow jade signature’s residents to enjoy a truly unique resort-like experience. by placing the parking garage below ground, the three amenity levels have a relationship to nature and the environment that is uninterrupted. Building Overview - The elegant tower is tapered from bottom to top on its east and west fac¸ades, and transforms from every angle. its slender fac¸ade and shape distinguishes it from all other buildings across the skyline. 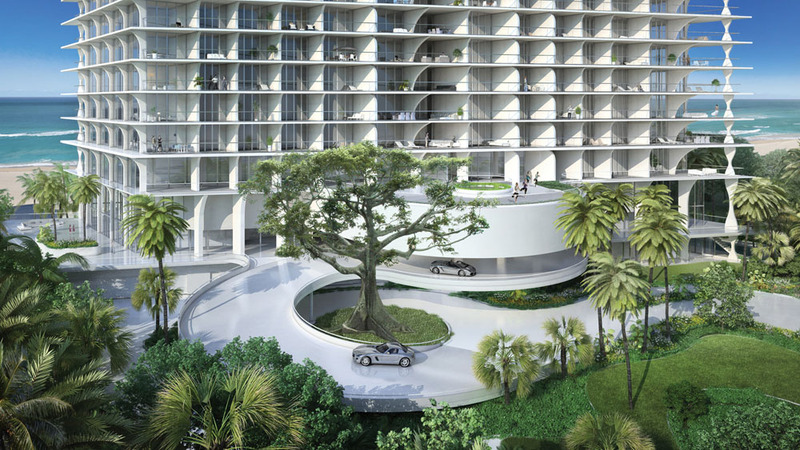 The Ribbon - THE LOBBY, THE BEACH BAR AND GRILL, AND THE SPA ARE AMONG THE BUILDING FEATURES THAT MANIFEST THEMSELVES IN A CURVED RIBBON THAT WEAVES THROUGHOUT THE STRUCTURE. THE RIBBON MOVES BEAUTIFULLY FROM THE INSIDE TO THE OUTSIDE AND CAN BE SEEN MOST PROMINENTLY AS IT FORMS THE PORTE-COCHÈRE AND BEACH PAVILION. THE SINOUS FORM OF THE BUILDING'S LOWER THREE AMENITY LEVELS CONNECT THE TOWER TO THE GEOMETRIES OF THE LANDSCAPE OUTSIDE. The Lobby - Doors open and you enter a world of elegance and inspired detail. Splashed in sunlight, the lobby is surrounded with glass immersing it within the spectacular backdrop of the blue ocean and horizon. 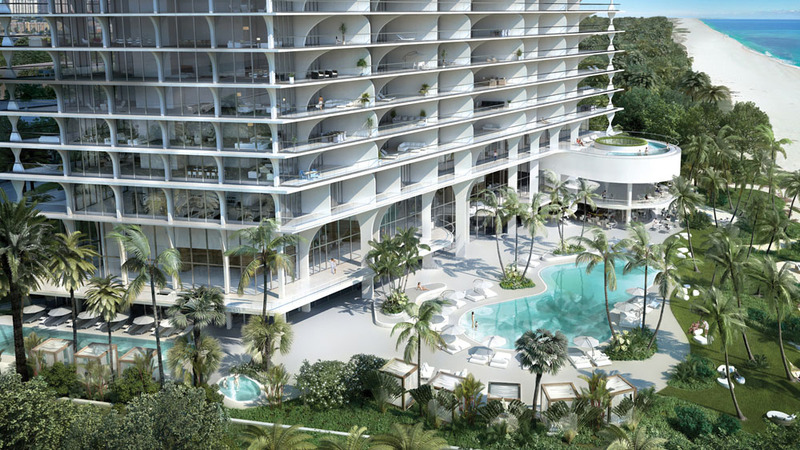 Continuous glass that not only spans to every corner, but soars three stories high to include both the lobby and beach level, which graciously connects via a sculptural spiral staircase. Beautiful wood and contemporary furnishings in hues of blues, grays, and white compliment the pristine white marble reception desk and floor, and follow the ribbon that runs through the tower carving interior spaces along the way. Botanical Journey - A building that seemingly rises straight out of the beach; Jade Signature is a living monument to natural loveliness. Lush but with a coastal feel, an atmosphere of fluid ease draws you in from the street, inviting you in to a uniquely modern relationship between design and nature. A curved grand entryway creates a beautifully landscaped journey of serenity, presenting an impressive porte cochere and sense of arrival. Nearby, a pedestrian walkway is surrounded by nature and gardens. On the ocean side, Landscape Architect Raymond Jungles is creating an outdoor environment enhanced with hammocks and lounge seating, and a tropical feel using big canopy trees and mature palms. 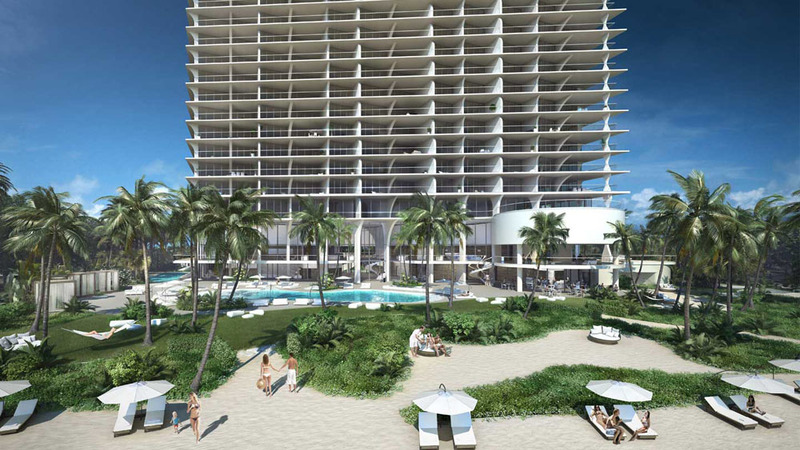 FEATURES & AMENITIES - Jade Signature embraces the good life. And nowhere is it more apparent than through the features and amenities of the tower. The beach level is defined by a seamless flow from street to shore, connecting you to thoughtfully placed amenities from the first moment you set foot on the property. Central is a spectacular resort deck - a refreshing oasis with two gorgeous swimming pools, secluded cabanas, lush gardens with hammocks and a beach bar and grill offering pool and beach service. The lobby level is a myriad of thoughtful conveniences. 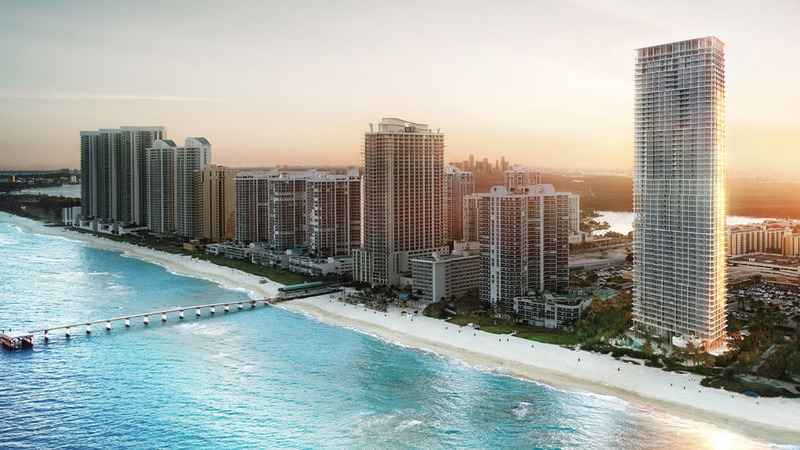 Luxury naturally begins with the worldwide concierge service, and continues with an array of amenities that include a breakfast area, a club room, and where sand and sky come together, Jade Signature captures the essence of outdoor living with the Beach Pavilion. 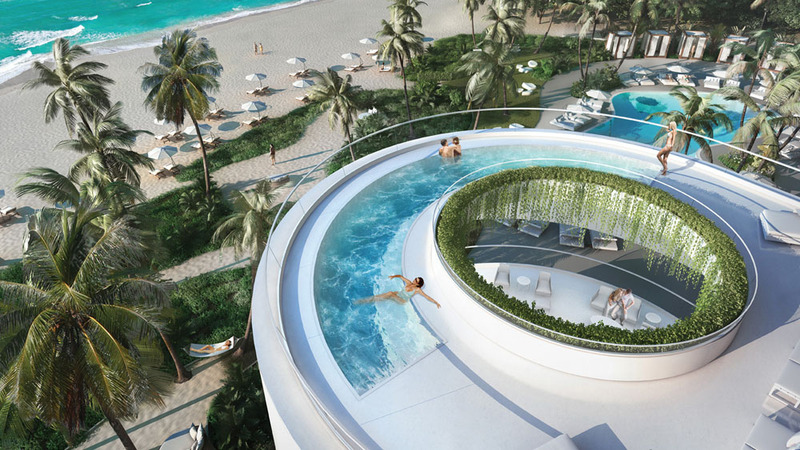 As much as Jade Signature epitomizes connection, it equally succeeds in achieving balance through disconnection - with a spa level dedicated to the art of relaxation. From the hammam to the water terrace, peaceful enjoyment will be in abundance. -Created by Pritzker award-winning Herzog &amp; de Meuron. -Stunning interiors by French design firm PYR led by Pierre-Yves Rochon. 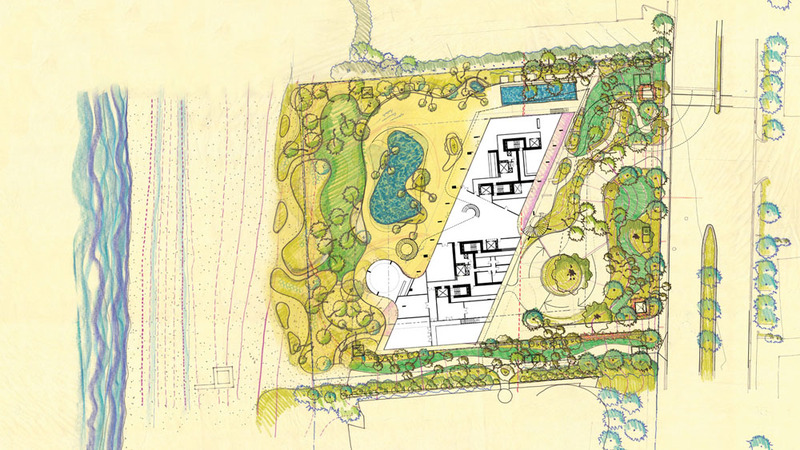 -Botanical journey cultivated by renowned landscape architect Raymond Jungles. 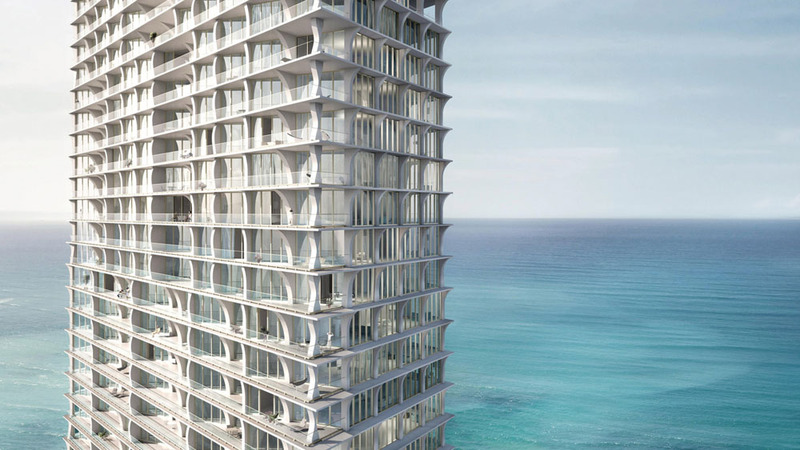 -Impressive structure towering 57 stories above the Atlantic shoreline. 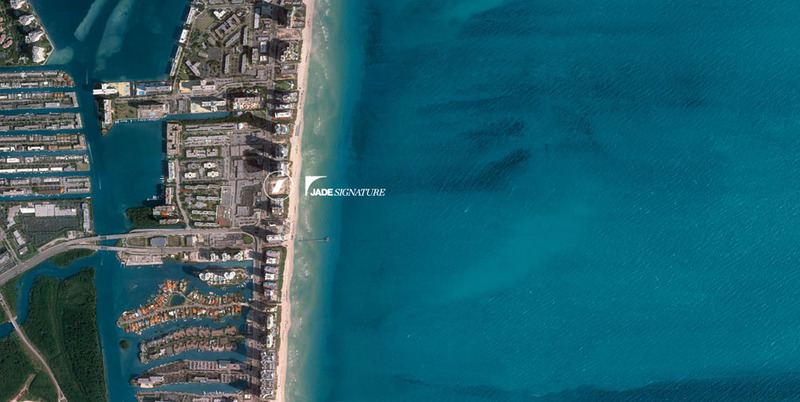 -Enviable beachfront address on the sands of Sunny Isles Beach. -Ideal location between Bal Harbour Shops and Aventura Mall, as well as Miami and Fort Lauderdale airports. -Strategic positioning of the building maximizing sun exposure to the pool and beach. 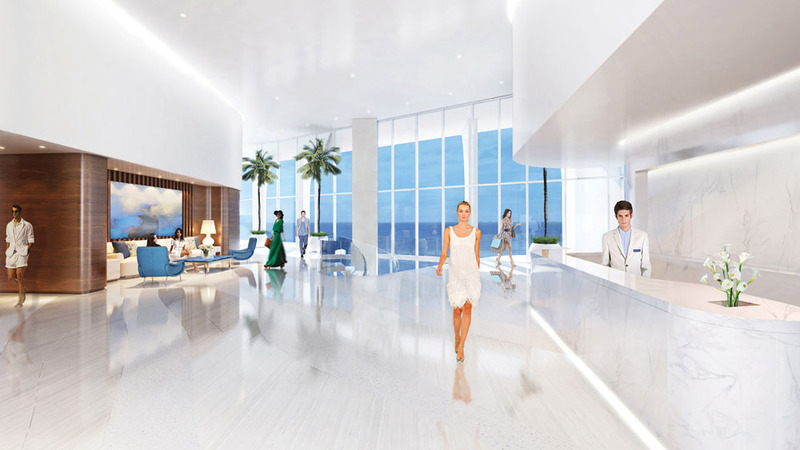 -Free-flowing amenity areas seamlessly connect ocean and beach to lobby and interior spaces. -Beachfront resort deck featuring an organic free form swimming pool with zero entry, secluded cabanas and hot tub surrounded by nature. -Beach bar and grill offering pool and beach service. -Private beach amenities including chaiselounges and umbrellas at the shoreline. -Kids playroom with video games and smart board. -Toddler sensory and reading center. -Beachfront garden and resort deck. -25 Meter lap pool on south side of tower offering maximum sun exposure. -Entertainment lounge and terrace facing lap pool with billiards, poker table and wine bar. -Lushly landscaped grand driveway with impressive porte-cochere. -Stunning two story lobby anchored by a sculptural staircase leading to a world of amenities and services. -Breathtaking three stories of glass over looking pool and beach. -Exclusive clubroom with extensive out door terrace and demonstration kitchen, perfect for private events. -Breakfast area with outdoor seating on beach pavilion terrace with sky dome. -Doorman and valet, at your service. -Business center with conference room and private office. -Underground parking garage with security surveillance. -High speed Internet and Wi-Fi in all common areas. -Health and wellness center with sauna and steam room. -Coed hamam / Turkish bath. -Relaxing water terrace with massage cabanas and jacuzzi overlooking the ocean. -Full menu spa services available. -Outdoor yoga deck surrounded by zen garden. -Beachfront state-of-the-art fitness center featuring Pilates reformers, free. -Women’s and men’s locker rooms. 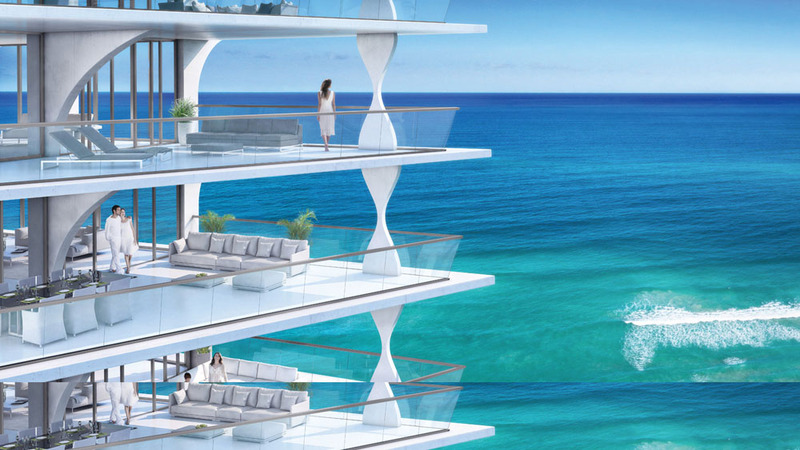 The Residences - Conceived as contemporary houses in the sky, Jade Signature’s homes are defined by a sense of freedom. 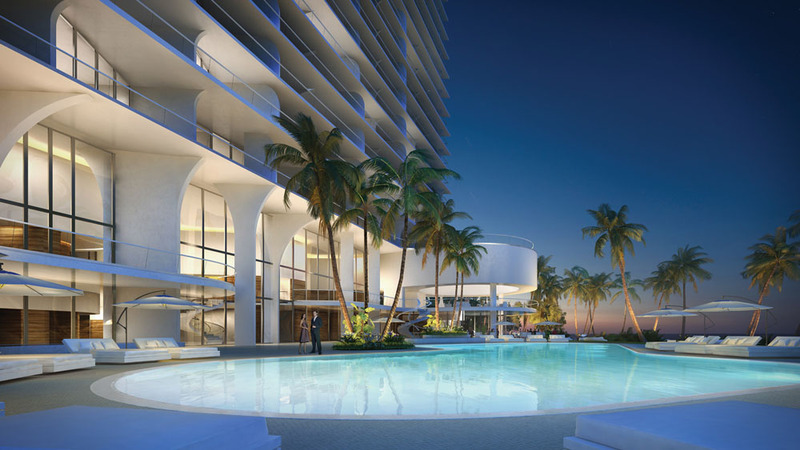 Beach breezes move effortlessly through these complete-flow-through residences, uniting endless views of the ocean, city, and Intracoastal. Day or night, the connection between nature and architecture permeates the living space with expansive terraces that act as gracious outdoor living rooms and a thoughtfulness in the structural design that eliminates all columns. The feeling of limitlessness even extends to the virtual world, with signature touch-screen software that grants customized control over lighting, entertainment, security, interior environment, and more, quite literally at your fingertips.